In the report, you will find numerous insights into the technology, processes, and data driving B2B eCommerce. The report also offers dozens of charts which summarize survey responses from B2B marketers, broken down by region, and commentary providing insights into the attitudes and expectations which are guiding B2B eCommerce initiatives across Australia and New Zealand, India and Southeast Asia. In the report, we first answer one of the most important questions regarding B2B eCommerce: does it have widespread adoption in the region, or is it something which is still in the planning stage for most companies? 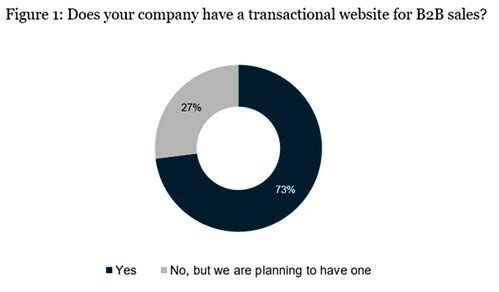 Our survey revealed conclusively that close to three quarters (73%) of companies in the region who have planned to support B2B eCommerce already do so and have a transactional website in place. Another important aspect of B2B eCommerce is the customer experience (CX) expectations. In the past, B2B companies have offered a different CX than their B2C counterparts. eCommerce, it seems, is leveling the CX playing field. More than eight in ten (81%) respondents agree – whether ‘strongly’ or ‘somewhat’ – that ‘professional buyers expect a consumer-grade digital experience’ from their websites. For B2B companies to offer transaction capabilities and consumer-grade CX, they must integrate their eCommerce offering with existing back-end systems and processes. So, how far along are companies in the region in this area? Our survey indicates that most companies have made significant progress with integration. Customer service capabilities are the most likely to have been successfully integrated with eCommerce operations, with two-thirds (66%) of respondents saying this is the case. 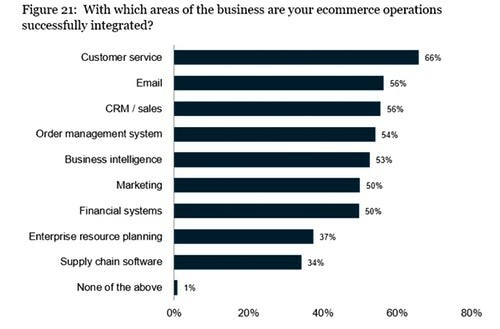 Additionally, more than half of respondents say that they have integrated their B2B eCommerce systems with email (56%), CRM/sales (56%), order management systems (54%) and business intelligence (52%). Despite having made progress in many areas of B2B eCommerce, marketers in the region still face some hurdles. While many B2B firms have successfully linked back-end systems with eCommerce, data integration is the most often-cited barrier to developing best-in-class eCommerce operations, with 17% of respondents selecting this as the principal challenge. This is closely followed by complexity of business (15%), and lack of strategy (14%) and, as our report notes, each of these play a crucial role in scaling B2B eCommerce systems. Of the four key areas involved in developing best-in-class eCommerce technology (people/skills, processes and workflows, technology, and data), respondents from all regions were least likely to be confident in their data capabilities, with only 46% of respondents rating their capabilities in this area as “good”. They were also least likely to be increasing their budget in this area, with just 42% indicating they would spend more on data over the coming 12 months – “suggesting a lack of ambition to address a clear area of weakness for many businesses”, as the report author notes. 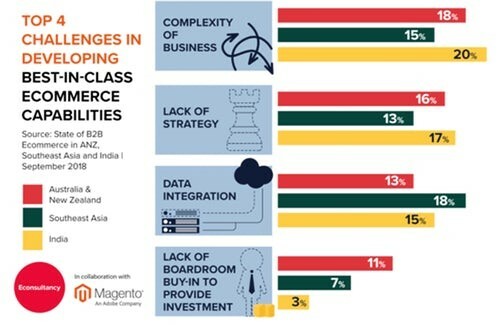 Nevertheless, Econsultancy and Magento’s findings show the great strides that businesses across ANZ, Southeast Asia and India are making in the realm of B2B eCommerce – and in particular, their commitment to integrating new technological developments, from diversifying their distribution methods to investigating the possibilities presented by AI, the Internet of Things, new payment solutions, and more.